After your breakfast in the riad our authentic journey will start towards Volubilis crossing via ouazan and other rif villages, in volubilis we will discover the best preserved roman ruins in morocco and learn about the archeological site of Moroocan history,after the visit of the ruins we will shift our way to Meknes city a 17 th century heritage, where we will stop for lunch and hang around the historical huge walls of the medina , including bab el mansour and moulay ismail tomb.after the visit of Meknes we will drive directly to Fes city where you will spend the night. 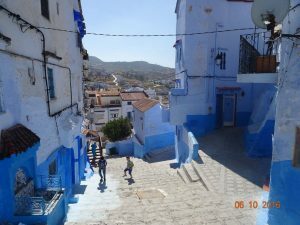 Today you will have guided tour to discover the medina and the famous Souks of Fes and its narrow cobbled streets are filled with ancient mosques and towering green-glazed minarets as well as the unique Andalusian architecture in every corner of the old city and its monuments, We will ensure that you visit all sites with cultural and historical interest including the famous Al Qaraouine University.The tour will includes olso a visit to the tanneries and the ceramic cooperative to see traditional moroccan crafts.Overnight at hotel/riad. We will pick you up from your hotel /Riad then, drive south to Azrou via Ifrane (switzerland of morocco) and then to the Middle Atlas mountains stopping by cedar forest to take some fascinating photos with the Barbarian Apes, we will continue the way through the Atlas Mountains enjoying the landscapes of Midelt, After lunch we’ll continue our journey through the Ziz Valley to Erfoud, Rissani before we reach Merzouga.Over night at your local Hotel. After breakfast we’ll start exploring the area, by visiting the village of black people originaly from Mali to enjoy their music and the way they live.after that we will drive to Miffis Mines to explore how they work over there before getting behind the Dunes in a full desert with charming views where we will sit for a warm cup of tea with the local Bedouins,Before returning back to the hotel,after a cup of tea your local guides will teach you how to mount and dismount and other handy camel-related safety tips afterwards you begin exploring the mysterious sand-sea of the Erg-Chebbi.Over night in a berber tent. We will make up early in the morning to watch the best sunrise of your life and casting different shadows and colours over the the sea of sand dunes, the highest in Morocco, before returning to our desert hotel,after breakfast,We will continue to Tinghir and the stunning Todra Gorge the highest, narrowest gorges in Morocco. the gorge is great spot for hiking and relaxing on the edge of the river or sampling some local Berber delicacies. After lunch in the heart of the gorge we’ll drive through the Dades Valley where we will end our day spending the night in a nice hotel located on the top of the mountain . 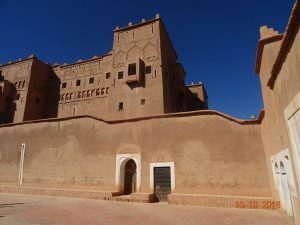 After breakfast in you hotel, we will drive through the Dades Valley towards Kalaa M’gouna (the city of roses) and Ouarzazat. The route through Dades Valley is the way of the thousand kasbahs providing numerous opportunities to take some of your best photographic shots of your trip we will stop for a short stop in atlas movies studio of ouarzazate before we drive to Ait Ben Haddou Kasbah,the largest Kasbah in Morocco, built by T-hami El Glaoui,one of the last Berber chieftains during the beginning of the XXth Century, it used to be one of his stops during his long travel from the Sahara to Marrakech.now one of the Unesco World Heritage Sites since 1987.After lunch we will shift the way to cross high atlas mountains full of panoramic view and attractive berber villages all along the way till Marrakech where the tour ends. Tourning in a modern, air-conditioned vehicle. 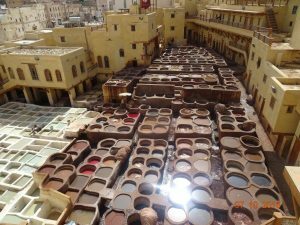 Official guide’s fee in the imperial cities – Fez. 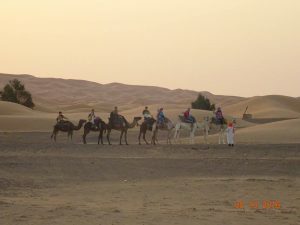 The camel trek and the overnight and Dinner at the desert camp. During the tour you will need to pay for Lunches. Drinks and Tips. If the itineraries that we offer do not match what you’re looking for, send us a message describing what you are looking for and we will prepare the trip to your needs and requirements.